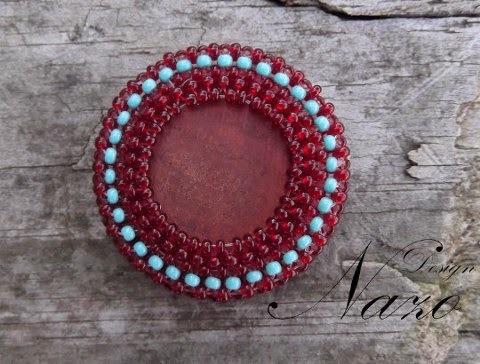 Inspired by nature, this beaded ring made only by seed beads, wood and fishing line. The shank part will be beaded according to your ring size. OR, alternatively, this creation can be turned into a necklace or a pendant upon your request or can be shipped as it is without any modification for you to use your current or future project. * Wood: It is one of the main components of the creation. The perfectly rounded wood part is situated right at the heart of the creation which is cut, shaped and painted (Wood Finish-Gunstock) by me. * Beads: Very high quality Czech beads are used to create this creation. Colors are: Opaque Turquoise and Transparent Garnet. * Fishing line: Instead of beading thread, I prefer to use fishing line when I make my creations. It gives more flexibility to the creation and makes them much more durable for you to enjoy for a long time. * NO METAL COMPONENT IS USED. Since the creation includes NO metal component, it is a great alternative for people who are sensitive to metallic components. The diameter of the creation is 1.36 inches (34.5 mm). Please let me know your ring size while checking out or sending me a message. If you prefer to use the creation as a component of your current or future project, please let me know. If you would like me to create another creation similar to this one with different color combinations, please do not hesitate to send me a message. I would be more than happy to create a unique piece for you! The item will be shipped from US.